Sometimes  though less frequently, it seems, with each passing year  a new band comes along that rekindles the fiery passion I once had for new music. Once in a great while, a new group or artist appears on the increasingly flat musical landscape that reminds me of those days when I'd spend hours inside a record store combing through new releases, reading liner notes, exploring, cross-referencing, learning, listening and, yes, buying. But so much of what we call rock music now is just uninspired, to put it kindly. There's little if any exultation any more when I think about new music. Maybe it's because there's so little joy these days in the music itself. Whatever the case, it's been a painfully long stretch since I've had that combustible feeling that compels me to share my excitement not only with family and friends, but strangers. But that rare jubilance came back when, for no particular reason, I bought a record a few weeks ago titled "So Much for the City," by a band I hadn't heard of called The Thrills. It looked somewhat interesting  there were a couple rave reviews from England on the little sticker on the CD cover  but my expectations were still low. What an ecstatic surprise! The Thrills, who I've since learned are already a smash in the UK and are just starting to really sell records in the States, are a kind of miracle. An almost frighteningly authentic slice of Southern California Americana, The Thrills have an immediately recognizable, accessible sound of sun-kissed, early '70s SoCal pop-rock and country-rock. This record turns CD players into time machines. But it's more than retro. 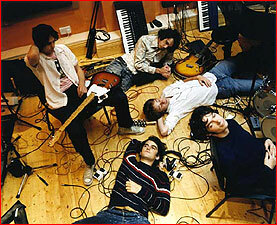 There's a wonderful bit of contemporary Brit-pop melancholy in the songs, too, that only give them more resonance. Above all a celebration of innocence, "So Much for the City" is a shimmering, strikingly mature and unexpected debut by a band that, if there's any justice, should soon take over the world. Happily wearing their unlikely influences on their sleeves, The Thrills' recipe of mentors include "Pet Sounds"-era Brian Wilson, Gram Parsons and Burt Bacharach. There are also homages to Robbie Robertson, Bob Dylan, John Sebastian, Richard Carpenter and John Phillips  with some Monkees, Motown and Beatles and Kinks thrown in, too. All this is lightly doused in a more modern marinade of atmospheric British pop a la The Cure and even Coldplay, as well as some of the ethereal jangle of art-rockers like The Church and 10cc (remember them?). For example, the end of the song "Deckchairs and Cigarettes," The Thrills' homage to San Diego, would fit nicely on a Church record, with that cool, neo-psychadelic Kilbey-Wilson-Piper vibe. If this all sounds too weird, too eclectic a mix to be cohesive, it isn't. If it sounds like the best pop-rock debut in years, now you're getting warmer. 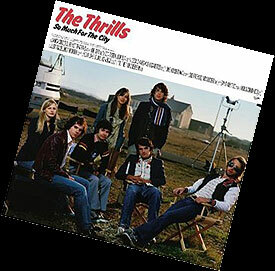 With "So Much for the City," The Thrills have served up an absolutely joyous collection of deceptively simple, radio-ready summer songs with cool changes, brilliantly quirky instrumentation, beautifully stacked harmonies and creatively arranged backing vocals, ridiculously catchy choruses, and positively captivating lead vocals. So who are these guys? Well, that's the utterly impossible thing: this band is comprised of five lads from ... Ireland! Yep, Ireland! How can this be? The story is, these five young Dubliners, all friends since childhood and all reportedly nice, polite, fun-loving and obviously talented blokes in their twenties, decided to take a summer trip to SoCal back in 1999. They had little money, and chose San Diego because they figured it would be a bit more laid back than smoggy, smarmy, overcrowded Los Angeles. So they rented a small, dumpy apartment just a few steps from the ocean in San Diego's Mission Beach area that happened to be right behind an old vinyl record store. That summer, they caught lots or rays  well, as many as their fair Irish skins would allow  listened to a lot of old records, and played and wrote lots of music. The result of this SoCal sojourn  and a subsequent trip to San Francisco  inspired songs such as "Santa Cruz (You're Not That Far)," "Big Sur" and "Don't Steal our Sun." Winners all. Both contemporary and wildly nostalgic, the songs on "So Much for the City" are the sunniest, most melodic sing-along tunes about California since the Mamas and the Papas. I just can't get these songs out of my head; they won't go away. I defy anyone who likes good melodies to listen to these songs and not find yourself humming them to yourself the next day. There are several instant classics on this record, songs that after a listen or two seem like they've been with you forever. The main brain behind this band, lead singer and writer Conor Deasy, 25, is a cross between Neil Young and Robert Smith from the Cure whose uniquely raspy/wispy yet penetrating voice grabs your attention right away. But what hooked me most of all are this band's extraordinarily lush, layered harmonies and arrangements. When that wall of "ahhs" comes in on the opening song, "Santa Cruz (You're not that Far)," you're taken back to the golden days of California music. You also have to love the country-rock flavor of songs "Say it Aint So," and the band's clear love for the Byrds, the Flying Burrito Brothers and Gram Parsons. A pure and almost childlike yet strikingly mature homage to California and the pop music giants who've lived and worked here the last 40 years, "So Much for the City" somehow captures the mythology of the Golden State with which anyone who's ever lived in or dreamed of California is familiar. But don't be fooled. This record isn't all suntan oil, convertibles and longboards. There's a wonderful sadness here, too, an unsettled yearning that exists comfortably within these happy-surfy songs. Like all really great music about Cali, there's always more here than meets the ear. After all, Brian Wilson, a songwriter who deserves mention in the same breath as George Gershwin, Cole Porter and Lennon and McCartney, is clearly Deasy's main mentor. Wilson wrote dozens of amazing pop songs that are pure fun, but his best very best songs are the bittersweet ones. Amidst the sweetness here there is bittersweetness, especially in the final song, a wonderfully hankering balled titled "Til the Tide Creeps In." Just listen to the record. If you're someone who rejects sweetness or innocence as legitimate concepts in music, you won't like this record, and you probably are an unhappy person. In fact, if music has to be hard or angsty or cerebral for you to get off, stop reading this column immediately and please go away. But for the rest of you, I urge you to buy this record. Celebrate it, hum along, call your friends, bring it with you to the beach or the lake or the mountains or on your vacation this spring or summer. Listen to it at work if you can, and in the car. Just listen. 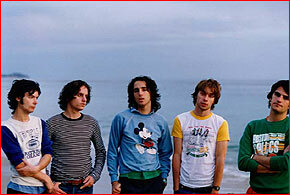 The Thrills have done nothing less than give me new hope for the future of rock music. Yes, they borrow liberally from the past, but so what! There is no such thing as a non-derivative band. The Thrills just do it openly, creatively, sparklingly. And in spite of all the blatant influences, they have a sound that is absolutely all their own. Implausibly, these young Irishmen have made one of a very few truly quintessential Southern California pop-rock records. I guess what enabled them to do this so effectively is that, in addition to their own collectively fertile imaginations and tender geniuses, they are indeed not of the time and place about which they write and sing. They're not even Californians, let alone children of the early 1970s. Heck, they weren't born when the music they love and emulate here was being made. But somehow in this darkening, dysfunctionally cynical world, through some sort of blissful quirk in genetics and geography The Thrills are still able to recognize their own innocence as well as the magic and promise of California. It isn't a wide-eyd record, though; it isn't naïve. It's sweet, but it is also informed and is undercurrented, as I've said, with a certain lovely sorrow. I hear they're up in an L.A. music studio now, starting work on the second record. I'm eager to hear it when it's finished, naturally. Sadly, though, the longer these guys stay in California, the harder it'll be for them not only to hold on to that precious innocence, but to maintain the same reverence for California, or for their American musical heroes. These things are fleeting. But don't let go of The Thrills. Never let go.